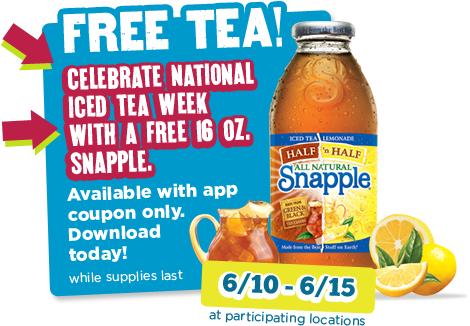 7-Eleven is giving away 16-ounce bottles of Snapple June 10-15 for National Iced Tea Week. To redeem the offer, download the 7-Eleven mobile app (on App store or Google Play) and pull up the coupon on the app. To locate a 7-Eleven near you, click here.